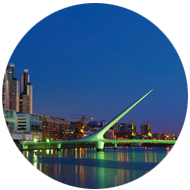 BUENOS AIRES CITY TOUR + DELTA. If you don´t have too much time to spend in Buenos Aires, this is the ideal tour to visit two places in one day. The tour will include the following: Plaza de Mayo (the main square of the city), Casa Rosada (Presidential Palace), Cabildo, and Metropolitan Cathedral (Pope Francis' Church). Then we will depart towards the Delta. We will have 1 hour boat ride. You will be able to enjoy the nature of the Delta of Tigre and learn about the peculiar lifestyle of the islanders. Back in the city we will visit: Recoleta with its amazing cemetery; in fact the 3rd most important in the world. Afterwards we will head to San Telmo, the old part of town, with its cobbled stone streets and its antiques´shops. You will also visit La Boca with its colorful houses, street art and football atmosphere everywhere and Puerto Madero, the recycled second port docks that was turned into the most modern part of the city.